The rest is code to first verify the new size is larger than the current size. 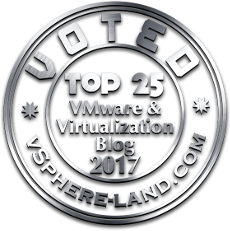 While the FlashArray supports volume shrinking, VMFS does not. The other code item is rescanning to see the new volume size and performing the VMFS volume grow. This uses that handy VMFS volume translator workflow again as well as the workflow that gets all of the snapshots of a certain FlashArray volume and a third workflow to overwrite a volume with a snapshot. A little code in the middle to identify the latest snapshot for that volume. Takes in a datastore object and does the rest. Pretty straight forward. 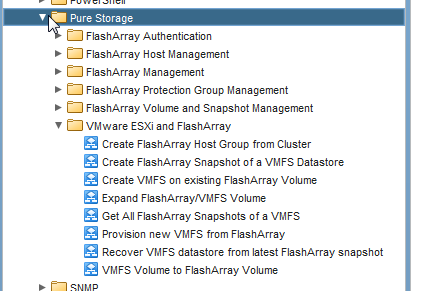 Takes in a datastore and returns all of the available FlashArray snapshots for the volume that hosts that VMFS datastore. Basically just hooks the VMFS volume translator workflow with the get FlashArray snapshot one. We are using vRO for automating for many Pure operations. We are customizing the workflow according to our need. Do you have workflow template for creating multiple luns as we do in Pure GUI with # sign? Not currently, but I think this is something I could build fairly quickly! Stay tuned. Could you send me the Expand FlashArray/VMFS Volume workflow? Thanks, i just installed it but these workflows dont appear to me. I need to install a certificate? I tried with your steps but I dont have pure storage GUI. How I can obtain a SSL certificate FlashArray? FlashArray certificate from URL in the FlashArray Connection Management folder. I do not know what FQDN or IP of the FlashArray to write. I do not know what I need to get this FQDN or IP, I haven got Pure Storage program for example. I hope I’m explaining well, sorry for so many comments. No worries. There is no Pure Storage external program/application. Everything runs on the array itself. So whatever the IP/FQDN you use to login to the array is what you need. If you have forgotten what that IP is, please open a ticket with Pure Storage support and they can help you find it.